Build Your Own Arcade Controls Dance Pads! If you're a member of the classic arcade generation like me, you've probably missed one of today's hottest arcade hits - Dance Dance Revolution! DDR (and the clones) are dance games where you dance the beat on your dance pad to the instructions on the screen. Get it right, your score goes up. Get it wrong, and eventually your game's over. There's always a crowd around these games, and sure enough you can play it at home as well! There are a bunch of good sites on the web on dance pads. Hit the above links to get started! Dance pads for PCs seem to be mostly unavailable. A couple have come out, but to date I do not know where to purchase them. If you have an insight on this, please email. 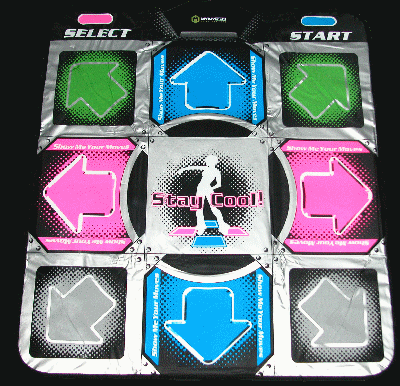 However, there are several dance pads available for the Playstation and Playstation 2. Through the use of the right PSX-USB adapter, the games listed above will work with these dance pads. Not all adapters will work. In a nutshell, the adapters have to present the pad to the PC as buttons, not axes. These dance games require being able to hit right/left and up/down at the same time, which is impossible with axes (try getting a joystick to hit left and right at the same exact moment). Two places to check for compatible adapters are Junta's page, and the USB adapter page at StepMania. Playstation dance pads can be found in a variety of places. One popular line comes from RedOctane, although others are available. Check out the forums at DDR Freak for more information. Of course, it wouldn't be BYOAC if we didn't talk about building your own dance pad! There are quite a few folks who have done so, I've include just a small collection of links below. Links below go to places that have instructions on building dance pads. This will involve a Playstation game pad hack, and some wood and sheet-metal work. Home-built dance pads tend to be more durable and you can customize them any way you like. If you can build a cabinet, you can build a dance pad! Know of another good how-to-build site? Send it my way please!